The sheet is limited to 375 numbered copies. 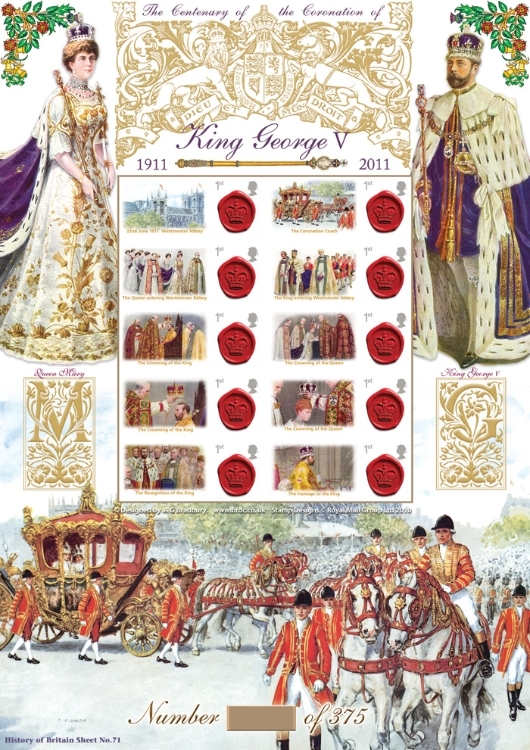 On 6 May 1910, King Edward VII died, and George became King. He had never liked his wife's habit of signing official documents and letters as "Victoria Mary" and insisted she drop one of those names. Neither thought she should be called Queen Victoria, and so she became Queen Mary. The new King and Queen's coronation took place at Westminster Abbey on 22 June 1911, and was celebrated by the Festival of Empire in London. Later in 1911, the King and Queen travelled to India for the Delhi Durbar, where they were presented to an assembled audience of Indian dignitaries and princes as the Emperor and Empress of India on 12 December 1911. George inherited the throne at a politically turbulent time. The Liberal Prime Minister, H. H. Asquith, led a minority government dependent upon the support of Irish Nationalists. Asquith's reforming People's Budget had been rejected the previous year by the Conservative-dominated House of Lords. Asquith had asked the previous King to give an undertaking that he would create sufficient Liberal peers to force the budget through the House if it was rejected again. Edward had reluctantly agreed, with conditions, and after a general election in January 1910 and fearing the mass creation, the Conservative peers let the budget through. Asquith attempted to curtail the power of the Lords through constitutional reforms, which were again blocked by the Upper House. Like his father, George reluctantly agreed to Asquith's request to create sufficient Liberal peers after a general election if the Lords blocked the legislation. After the December 1910 election, the Lords once again let the bill pass on hearing of the threat to swamp the house with new peers. The subsequent Parliament Act 1911 permanently removed the power of the Lords to veto money bills. As part of his Irish policy, Asquith sought to introduce legislation that would give Ireland Home Rule, but the Conservatives and Unionists opposed it. Desperate to avoid the prospect of Civil War in Ireland between Unionists and Nationalists, George called a meeting of all parties at Buckingham Palace in July 1914 in an attempt to negotiate a settlement. Before an agreement was reached, political developments in Britain and Ireland were overtaken by events in Europe, and the issue of Irish Home Rule was shelved.